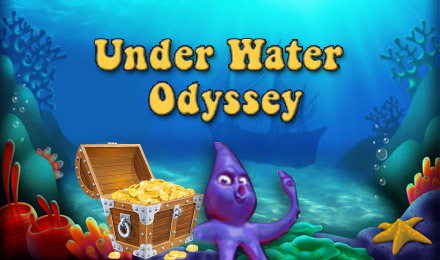 Swim to win at Underwater Odyssey Slots! This 5-reel adventure has sea, treasure & pirate icons splashed across 25 paylines. Underwater Odyssey Slots is a watery themed game which contains tons of deep sea creature characters. There are 5 reels and 25 paylines and you can bet up to 250 coins. There are all sorts of maritime symbols including the deep sea diver and fish. The slot also features fun, themed sound effects which make it even more atmospheric. The game features the Octopus as the Wild and the Treasure Book is one of the two scatter symbols which activates the free bonus spins round. The second scatter symbol is the Lady and three or more of this symbol across the reels with activate the fun bonus game. The bonus game is a Prize Pick and you can choose up to 5 items from 10, securing guaranteed coin prizes. Underwater Odyssey Slots has a great theme and gives players the chance to maximise their winnings with fun interactive bonus features.